Today’s cost-conscious consumers want easy and inexpensive ways to enhance their living spaces without breaking the bank. Luxury Homebuilder Jorge Ulibarri builds million dollar homes and says anyone can add affordable architectural elements that give a home that custom look on a budget. One of Jorge’s most stunning and functional design ideas starts underfoot with floor transitions and ends upwards with archways. 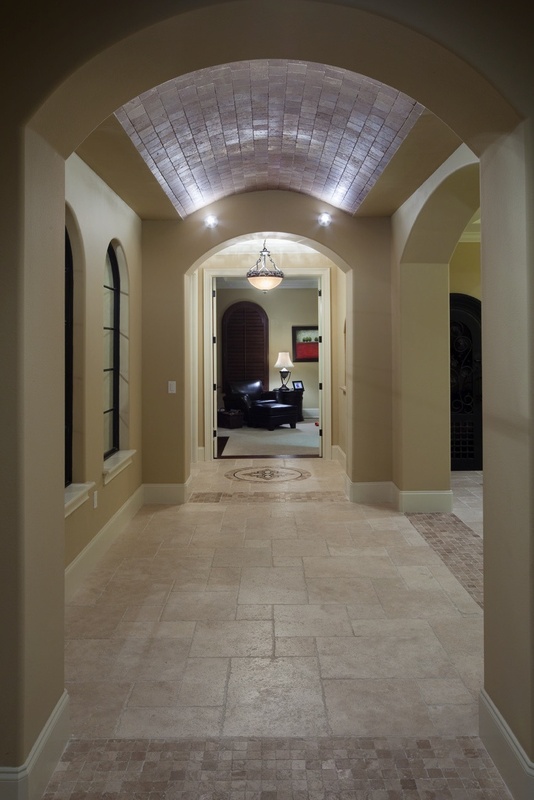 “There are many affordable ways to create and define space in a home with the strategic use of floor transitions and archways,” explains Jorge, who has more than a decade of experience designing and building custom homes for all budgets. What is a design transition? A transition visually divides space. It’s a design element or embellishment that visually marks a spatial boundary or highlights an architectural detail. 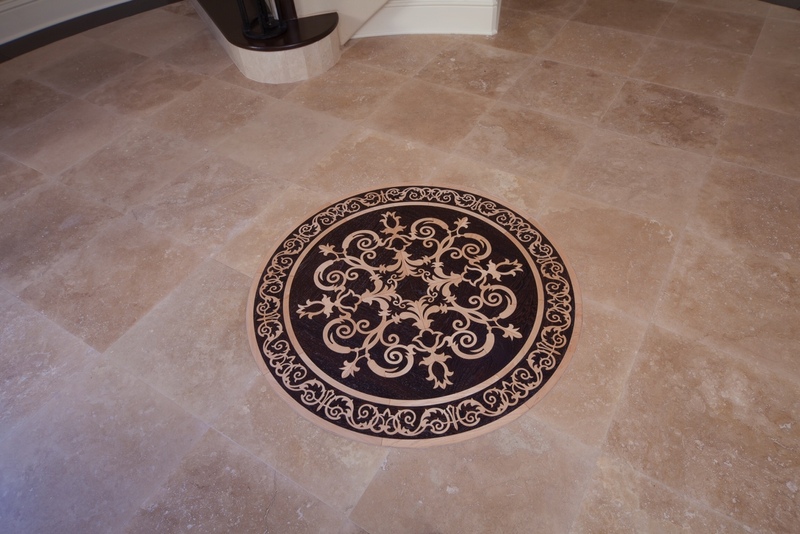 Floor medallions also serve as eye-catching focal points to define and highlight a space, especially in high traffic areas of the home. Jorge uses two types of floor medallions in his homes: wood inlaid and travertine mosaic. Jorge says there are thousands of choices when it comes to floor medallions. 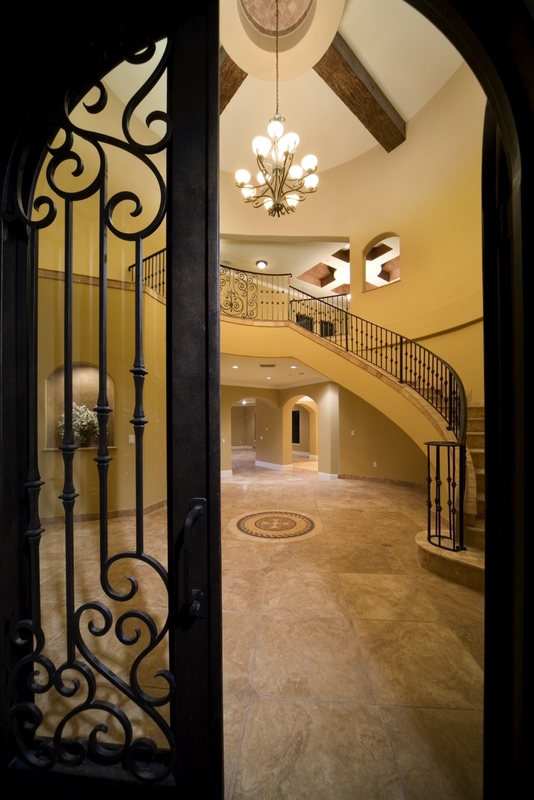 The example pictured with this article is in the tower entry of the home. It is a 36-inch medallion. “To save money, we enlarged it to 48 inches by adding 4 by 4 mosaics all the way around it to compliment the staircase risers, which also have the same mosaics.” The cost to add this travertine medallion is $120 for materials and labor according to Jorge. Wood floor materials also make artistic transitions from room to room. Another creative idea is to use wood floor planks to “frame” around stone or tile floors. The wood accents can pull from the beams or tongue and groove ceilings to create a lot of warmth and character. Instead of blowing your budget on interior decorating, consider investing in visual enhancements to the bones of your home -the walls, floors, and ceilings. The return on investment will be much greater with a well-built home that showcases itself instead of a home that requires overdone decorating to “dress it up” and compensate for architectural shortcomings. For more home design and construction trade secrets and tips, check out the video series, “Trade Secrets by Jorge,” on YouTube at www.youtube.com/user/jorgeulibarri You can also post your questions or comments to his Facebook page: www.facebook.com/Jorge.Ulibarri.Luxury.home.Builder.